A delegation from Front Line Defenders, a human rights monitoring group, has reported that over 30,000 people have been displaced, healthcare facilities burned and Papuans deeply traumatised by Indonesian military operations in Nduga, West Papua. The Nduga Case Investigation Team from Front Line Defenders, which included respected human rights advocate, Theo Hasegem, and Father John Djonga, gathered extensive information on the human rights and humanitarian crisis in the region, reporting it to the Amnesty International office in Jakarta on Friday March 29. The Investigation Team estimated that over 32,000 people have been internally displaced as a result of the operations, and schools have closed as a result. Mr Hasegem reported that, ‘Some civilians even died while in refugee camps’. The conditions for internally displaced persons are reportedly poor, with mothers being forced to give birth without adequate healthcare facilities and children and elderly Papuans lacking food and water. 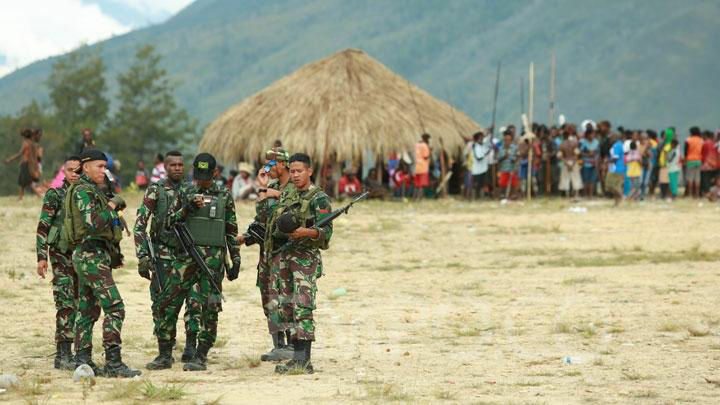 The military operations, the Investigation Team stated, have been accompanied by assassination of civilian Papuans. Two school children, for example, were shot dead by Indonesian security forces in the Mbua district. According to the team, it is likely that ‘military forces dropped bombs using helicopters during air attacks in a number of districts’. Thirty-four schools have reportedly been damaged by the Indonesian military, and the Sion GKI church has been converted into a military barracks. Father John Djonga called for Indonesia to allow access to media and humanitarian organisations to West Papua, and for a UN human rights mission to be granted access. In January 2019, the ULMWP Chairman, Benny Wenda, met with the UN High Commissioner for Human Rights, who promised to try and visit West Papua. The Investigation Team will submit their findings to Indonesia’s National Human Rights Commission (Komnas HAM).